I mentioned, on Wednesday, that I had some pretty cool news regarding my health/fitness journey. It's a journey I've been struggling a bit lot with lately....not really sure why except to say I've been pretty lacking in the motivation department. As with a lot of areas of life and like a lot of us, I tend to run hot and cold with things. One day I'll really be into it...the next....meh. This, though....this really grabbed my attention and speaks to the core of why many of us struggle with weight loss and getting fit. In either case, I think the answer is a resounding 'Yes!'. When I was younger I wouldn't have much of a problem eating what I wanted and in whatever quantities I wanted. I also had a younger metabolism backing me up. That 'young guy metabolism' has headed south, so now it's not just about exercising.....it's about how much and what, exactly, I put into my body. I've never been one to "diet" and have always been of the "eat what I want and just work it off" mindset. 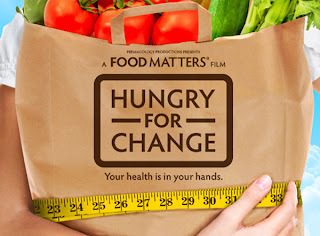 My wife, who is always looking for new ways for us to get healthy, sent me a link for a website called Hungry For Change. It's all about the poisons we're literally putting into our bodies and what they're doing to us. It's a pretty powerful documentary which you can watch from the website (you have to register) or, if you have Netflix Streaming, you can watch it HERE. Last Sunday we watched it and it really impressed me, for two reasons. The first was that the people giving the information had all been there. Most of them were chronically overweight or had other ailments that forced them to look to alternatives to help, in some cases, save their lives. They weren't "models" or "fitness gurus" or folks who were blessed with that 'young person's metabolism' trying to sell you something. They had been there and had done that. The other thing that impressed me was that they weren't selling anything. They were laying the information out there and you could use it (or ignore it) as you saw fit. It wasn't 'preachy', it was just plain, matter of fact, talk based on common sense and research. Honestly, it really opened my eyes to just what, exactly, I've been putting into my body. I'm, usually, very skeptical of these sorts of things but what they were saying made an awful lot of sense. That night, after watching, we went and bought a juicer and have been stocking up on fruits and veggies. The first concoction we tried was from the recipe book (included)....an apple, carrot, celery mix. I know it looks a bit....odd, but it was really good. Oranges from a juicer is awesome, I just have to say. We also tried a few other recipes, adding things like cilantro, kale, and parsley A word of warning, though, a little of those goes a long way taste-wise We did a tomato, carrot, celery mix and threw in some kale...and it wound up being too much. It had an "earthy" taste, as my wife described it, but I thought it tasted like grass. What? You've never eaten grass before? Anyway, we decided to try a 'mini-detox' type of thing this past Wednesday where we'd just drink water (a LOT of water) and juice a bunch of stuff. The documentary talks about trying to do this every so often to clean the system out of heavy metals (mercury) and such that stick with us in the processed foods we eat. We wound up 'amending' the 'fast' just a bit....having some salad, fruit, and gluten free cheese to get us over the rough patches but, all in all, we did pretty well. We plan on doing another next week. The most important thing, though, was that it helped in motivating me and getting my mind right. A healthy mindset is the first and most important step in the road to getting fit, in my view. 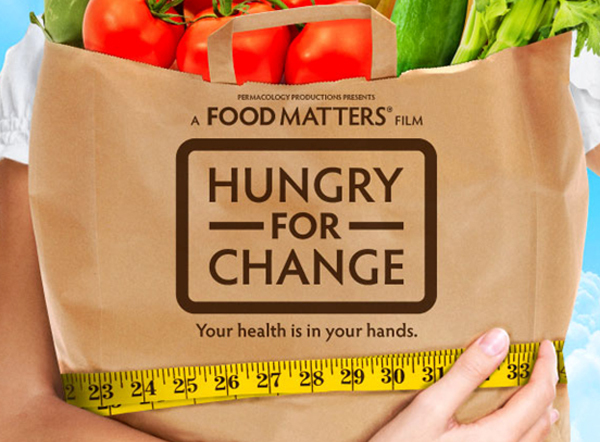 If you get the time/inclination, give this a watch and see if it doesn't change (or start to change) your view on processed food, eating, and nutrition. I know it did mine. 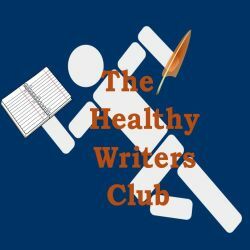 This has been a post (obviously) for The Healthy Writer's Club, hosted by Shallee McArthur. Any health/fitness goals in your future? If so, how are you doing with them? Ever tried juicing? Have a great Friday and an even better weekend! I decided to come over and meet one of the other minions for Jeremy for the A-Z Challenge, and I'm glad I did. My daughter has introduced me to a more natural way of eating, as well as the benefits of herbal remedies. She has been working with a doctor who is heavy into holistic medicine and an Eastern approach to diet, which is so different from what we do here in the States. It makes good sense to put natural things into our bodies and not all that artificial stuff. Eating right goes hand in hand with exercise. You have to do both. We eat very healthy here and there's certain foods we just don't buy. We also avoid anything in a can. Fresh or frozen only. You should watch Food, Inc. That will freak you out as well. Great job, Mark! 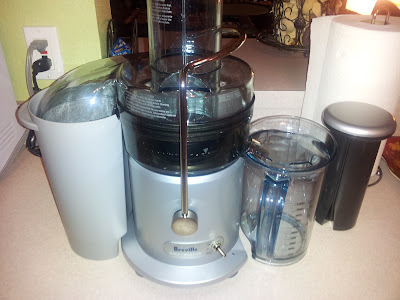 I love juicing and was so surprised at the number of options and how great it actually tastes. We eat a wide variety of things. Mostly healthy. Good for you for taking things a step further. I'm glad you and your wife are getting healthy together. As long as it makes you happy. I struggled miserably with my weight for many, many years. It doesn't matter how long you live if you're unhappy. I'd rather be happy so I don't struggle anymore. ~ Old, fat, and very happy. I need a new blender. I've seen half of that movie then I lost the link. I'm very excited it's on netflix so I can finish it. We've been trying to eat healthier too. We hadn't thought of getting a juicer though. That might be a good idea. I've heard a lot of people talking about this lately and will have to check it out. I know I should be healthier, that's for sure! Interesting. I'm going to have to check it out. I've never tried juicing, but I don't really like juice. I've been doing good this month, though. I lost 5 pounds. Eating better. Now I just need to do better with exercising. Have a great weekend! I'm glad you're trying the health stuff. I wasn't much into what I call cow food (meaning grass and green stuff). It was not natural, as who have heard of vegetarian dragons? But still, chronic ailments sort of forced me into that path. The trick is re-educate yourself to make a healthy transition. It can be as smooth or as difficult depending on the individual organism and how intoxicated it is. My greatest recommendation is, keep a close eye that it is still balanced and you cover all nutriment requirements well. You have my vote... for what, I don't know, maybe for president. Keen thinking, juicing. I was on juice for a year and half. But I did gain some weight because my organs were out of whack to begin with. Cured the organs but now to get rid of the weight. I saw a killer exercise program on TV called "INSANITY." (I think that was the name). I wanted to order it but then I wondered if I was crazy. I'd prob easily kick the bucket. Oh but those tummy's looks so flat and the pecs so sculptured. Rippling thighs and no sign of cellulite. Dummy me, I'm sure they were 18 and had marvelous genes. Hey, good luck with your wonderfully positive health program. Everything in moderation is what Mom always said, and she was probably right. Too much of this or that (even exercise), and the body rebels and automatically goes into protective mode, pouring on the stress hormones and storing fat. 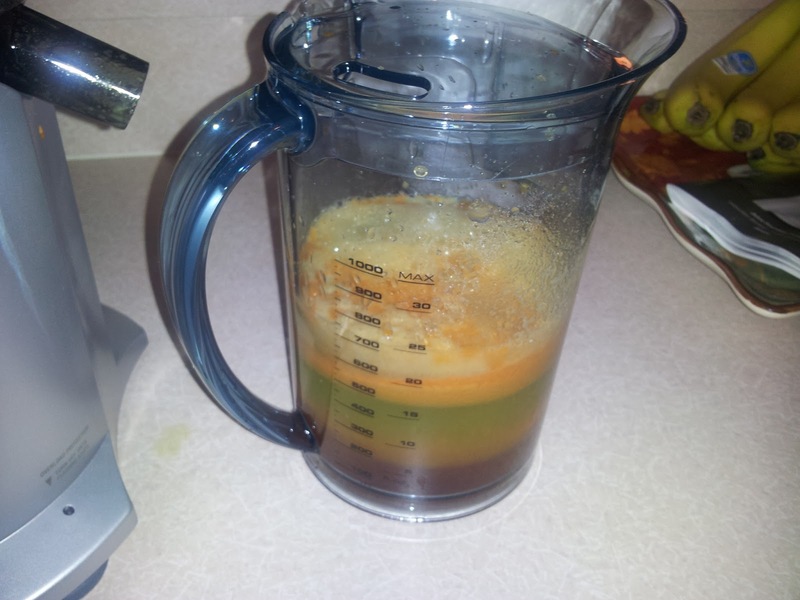 It is good to juice, though, as much as you can, maybe replacing a few meals a week with it. I'm glad you're making a good effort and hope you have great results. I'm doing my best to eat healthier too. I've heard of this documentary, and will have to take a look. Good luck with your healthy eating! Your post has left me feeling informed and thinking more about my health. I've been planning to get a juicer for a while. I have a friend who cannot eat a lot of things as it will make her sick so she had to come up with healthier things to eat. She's done a lot of things like this and has gotten me thinking about it as well. Such as eating fruit and veggies for snacks instead of chips or sweet things. It has really helped and I always feel better when I do it. I need to be more faithful though. That drink looks scary, but I'll bet it is good. I'm a dedicated locavore! If it's not fresh or seasonal it doesn't go onto our plates. Good for you. @Regina: Thanks and that's one of the great things about juicing...all the variety! @Carol: It's going to be a slow go of it, but we'll get there. @S.P: So far, we've found a lot of 'pros' and no real 'cons' with juicing, so it's something that's working for us. @Al: Thanks Al, and you do the same. The right mindset is key to getting healthy, for sure. @Manzanita: Where were you when I was running for class president?? Seriously, though, glad you got your internals straightened out and the weight will come off with some work and time. I've seen 'Insanity' and, for me, the insane thing was paying that much to try to lose weight. We have to remember that there is -no- quick fix. @walk2write: Oh, totally agree...moderation is key! @Maurice: Exactly what I was thinking as I watched it come out. It did taste pretty good, though. Well, I've been a total hippie for like forever, so all I can say is it is SO awesome that more people are getting into healthy food. Around here, we spend a scary amount of $ on food and only buy organic. I worked at an all-organic health food store for several years which helped me make the switch. Avoiding chemicals is so important. Exercise is crucial, too, but eating right is a big part of having the energy and healthy joints that make it possible to exercise. The change of seasons is an excellent time to detox. Fasting is really hard, but even just one day of juice fast can get you back on track to healthy eating. It's also a great way to do writerly "research" about how hard it is to go even one day without food. Cheers to eating well and feeling good! Some of my relatives have been doing something similar. They have actually lost a lot of weight and really enjoying the benefits of their juicer. A most informative article and yes, I get juiced as in juicing, a lot. As for eating grass...okay, wont mention I never tried it that way. Ahem. A healthy body is conducive to our overall mental health well being. And absolutely, the right nutrition is a vital link to it all. Take care, I'm going for a lie down! I tried juicing, but it's a nightmare in the winter in my country, since the variety is shot to hell. I do, however, agree with you that it's important to pay attention to what you're eating. I'm cutting back on refined carbs and sugars and drinking a lot more water. @mshatch: Yes, it's definitely a good start for us. @Shell: Oh yes, we found out just how hard fasting was. I think it's something we'll have to 'build up to', but we'll get there. @Mel: We hope to see some of those reults too! @Misha: We're definitely drinking more water and I'm seeing if I can switch to "raw" sugar from (white)granulated. Eat Healthy is the mantra here. I've never much cared for processed foods, but after reading several reviews of "Salt, Sugar, and Fat," I'm flabbergasted at how some of this processed stuff can be called food. I heard ya when you wrote about the metabolism from one's salad days. Oh, but I could also eat what I wanted without a caloric fear in the world.